Dhanteras is auspicious occasion as per hindu mythology. Dhanteras is the first day of diwali festival. This festival is also known as Dhan Trayodashi. This year dhanteras will be celebrated on 9th Novemeber, 2015. On dhanteras we worshiped goddess lakshmi to provide prosperity and wealth as a blessing. Buying gold on dhanteras is tradition. It is believe that gold purchase on this day bring good fortune and never diminish. You must be ready to go out and shop gold on this day, However, before you actually decide to buy gold let’s take a look at some facts and figures about gold. We have recently seen that gold price is showing correction up to 26000 Rs/. Gold price is reduced by 4% compare to previous year. In the global market gold is trading at lowest level of the month. This recent downturn in gold may not be temporary and it may continue in future. Probably it doesn’t make any sense to buy gold at current levels. Gold is giving constant negative returns since past three dhanteras. Let’s look at the gold price history of past five dhanteras. Gold is losing shine since past three years and expected to under perform in future. Gold Import Reduction – Gold import is reducing because of increase in gold import duty and reduction in gold demand. 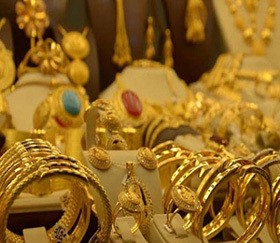 Gold demand in local market is likely to remain weak. Demand of gold is reduced by 10-15%. Gold Monetization Scheme – Gold monetization scheme is recently launched by Prime Minister Narendra Modi. Gold monetization scheme will further reduce gold price globally as demand of gold will be fulfilled locally. Gold Demand and US Dollar Decline – Weak fundamentals like stronger US dollar and decline in investment demand will push gold prices even further to lower level. Fed Rate Hike – It has speculated that gold may fall to Rs 20,500 per 10 grams in India if the US fed announces a rate hike which is inevitable. If you are still want to buy gold on Dhanteras than buy 1 gm gold as a token of prosperity with religious reason. There are various methods of purchasing gold. You can purchase gold in terms of jewellery. If you feel price of gold is high you can purchase light weight jewelleries, but remember physical jewellery purchase will be always costlier as you need to pay making charges and VAT. Similar to this you can purchase gold bar or coin etc. but still you need to pay VAT. Best way to invest in gold is by means of purchasing Gold ETF. Gold ETF can be purchased even with very small amount like 1 unit (Equivalent of 1gm gold). So on this Dhanteras avoid big buying of gold and purchase only 1 gm gold or 1 unit Gold ETF as a good luck. Happy Diwali & Happy Dhanteras in advance.